Aside from being a comic book artist I’m also a devoted Catholic. I believe in guardian angels. There has been a lot that has happened in my life that started back in 2008. It has been a very tumultuous time but through it all I have had my faith. After losing my job and getting hired to do really crappy jobs, I’m back in the education field. It has been difficult but through it all I know that God was with me. I lost family members and close pets. I know that there was an angel on my shoulder the whole time looking out for me. That’s what my new series is about – angels. I uploaded three of them to my fantasy art page. I have more but I’m looking for the right scripture to accompany the image. I’m very excited to be doing this series. Categories: Personal Musings | Tags: angels, chibi angels, guardian angels, Personal Musings | Permalink. So I’ve been working on my angel series which has been very therapeutic as far as helping me get over events in my life. As I said earlier, I was laid off work four years ago and had several deaths in my family. The last four years have been difficult for me. I’ve been working on an angel series because I truly believe I’ve had a guardian angel watching over me. I never would have been able to make it and keep my sanity without the help of God and my family. 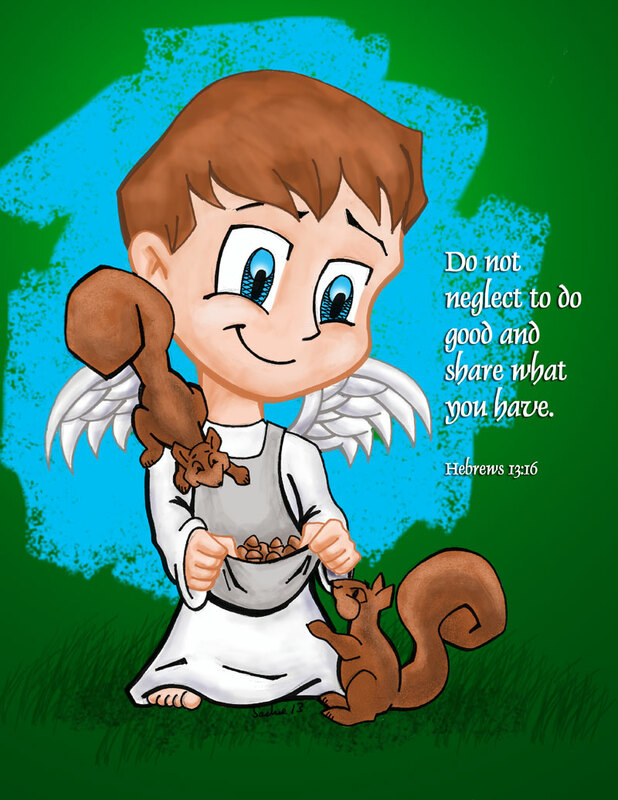 I think I should add a commentary to my angel series so people know exactly what the significance is of the images and why I chose the Bible passages I did to accompany them. I’m also working on getting an online store up and running so if anyone wants an angel print for their home they may purchase one. First things first, I need to find a good printer. 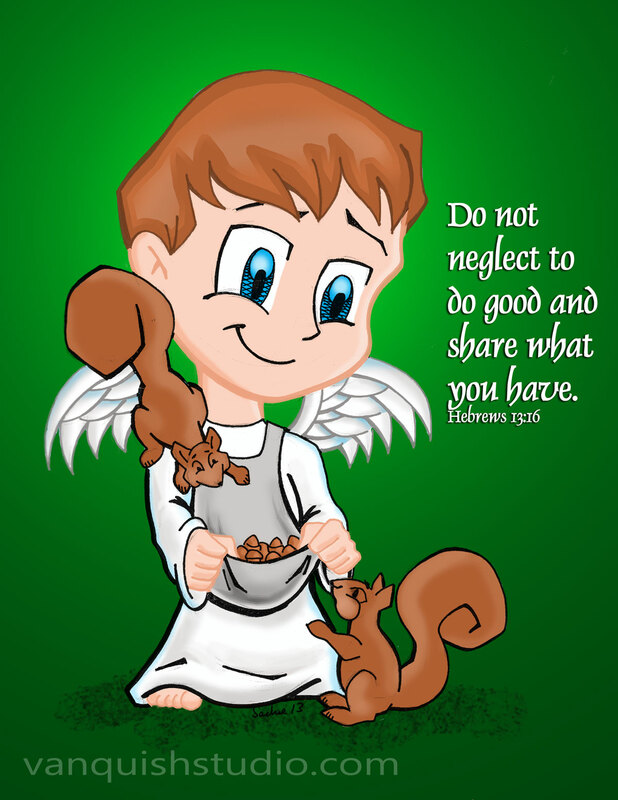 Categories: Personal Musings | Tags: angel series, angels, Bible scripture, chibi angels, devotional, inspirational angels, Personal Musings | Permalink. As I’ve stated in earlier posts, I feel I need to come up with a style unique to Vanquish Studio. I really enjoy drawing, inking, and coloring fan art and I get a lot of compliments on that style but I don’t want to just be a fan art artist. Of course, that doesn’t mean I’ll stop doing fan art. In fact, I’m working on some more Batman characters which I’ll post as soon as I’m finished with them. I would like to do something to show my appreciation to having found God and having a divine presence in my life. I lost my job four years ago and had several deaths in the family (four to be exact) which have made life difficult. I really credit God with helping me keep my sanity through all the tragedy. I thought I would use my comic style, or something close to it, for my angel series but it just didn’t fit. Instead, I tried a more painterly style which I think works better. I’m going to continue to develop this style of coloring for my angel series. Categories: Uncategorized | Tags: adobe photoshop painting, angelic art, angels, chibi angels, digitally painting angels, how to draw, painterly style of art, painting angelic art. digital painting, Professional | Permalink.